"You are calling me...I am stronger, stronger, stronger...I am the embodiment of your evil thoughts...thoughts you have not dared to think until now...You have always wanted to see these movies...Now, miss them -- if you can!" "If the Central Illinois horror movie host hall of fame has its pioneer, then Peoria radio-TV celebrity Milton Budd appears to get the honor." So begins Dan Craft's entry on Milton Budd in the "Legends of Late Night Horror" article from the October 26, 2000 entertainment section of Bloomington, Illinois' Pantagraph newspaper. Milton H. Budd was born and raised in Peoria, Illinois. In the1930 Peoria High School Crest (see bottom right), Budd was named "Peoria High's silver plated tenor". It would continue to be his resonant voice that would get him recognition. Not long after graduating, he got work at WMBD radio and eventually became known for a devilish character he'd do at grid dinners. His creepy, sardonic laugh was remembered by new WMBD-TV executives when it came time to find a host for their recently acquired Shock syndicated horror film package. 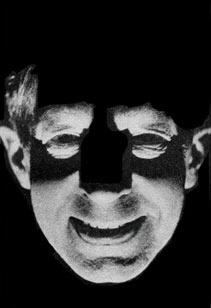 In 1958 the new television station aired Nightmare Theater starring Milton Budd as host. Visually, the program was stark and haunting. Against a pitch black backdrop, Budd, dressed in black, sat motionless. His face, lit from below, was about all you saw of him. But it was that voice -- the frightening tone, menacing words and his cackling laughter that made its impression. Another memorable aspect of the show was done by experimenting with the new medium. Engineer Charles Tate was on the controls and used a "negative polarity" effect on Budd's seemingly floating head to make it all the more unreal. Another thing Tate would create was a smaller duplicate head that would appear on Milton's hand. Milton's "son" was born! "It was all done live, except for the movie itself," Tate recalled, "He would interrupt the film every seven or eight minutes to comment on what was happening, and he had this terrible, horrible cackling laugh...He was a very popular personality." Nightmare Theater lasted until 196 -?. Milton Budd co-hosted along with Bob Carlton a drive-time morning radio show on WMBD-AM. Milton Budd passed away in the 1970s.
" We all waited every saturday night, the anticipation would start even before supper. In one way I would look forward to it, in another, I knew that I was going to regret it when it was over and had to go to bed. Milton Budd was genuinely a very scary individual when the lights went out and Nightmare came on. Very low creepy music, wierd sounds in the background, nothing remotely comical or hokey like other shows that came later with 'horror hosts.' He never said anything grotesque or gory, it was his laugh and his voice and the look on his face, which was all you saw. You would hear his low absolutely quintesential ghostly laugh as his lit up face would appear in the distance of the black screen. NO ONE ever could top that laugh, it would send chills right up your spine and make you grip the chair you were sitting in. His voice was low, but mellow and he would tell a story about the movie before it started, and as the movie would begin you could see his face fade out a nd that chilling laugh as he would say 'welcome to nightmare.' He did all of the bits after the commercials before the movie would resume and no matter what movie they played, HE was always scarier than the movie, so much so that sometimes you would close your eyes or turn away. But it didn't matter, his voice was enough to do the trick. At the end of the film he would return and tell you goodnight, as if that were any possibility, and fade away again laughing that hideous laugh. There was a station identification card used that said Nightmare at the bottom, the background was an artist rendering of a deserted graveyard with a vulture sitting in a creepy, leafless tree. He had a name for the vulture, it was his pet. When I would go to bed after the show, no matter how late I stayed up after it was over, in the darkness I would still see that lit up, floating face. I went to school with Milton's daughter Beryl, and one time he appeared 'in character' at one of her birthday parties, d own in the basement with the lights out and a flashlight pointed up at his face. He still scared the hell out of the kids, and they knew it was just Beryl's dad. He was the absolute master of the craft, no one even came close. Simply legendary." "I am from Peoria and have been a "monster movie" fan since about the age of 5 when I discovered "Nightmare" on Saturday nights at 10:30. This was way back in 1963.....we would always be at my cousin's house on Saturday night. The "grown-ups" would be playing cards and we kids, about 5 of us... would be huddled around the T.V. waiting for Milton Budd to come on and petrify us with greatest intro. any monster movie host ever did! This guy was genuinely scary with his deep laugh and "under the chin" lighting. Very, very creepy and very,very effective. Some years later, I did see the "Acri Creature Feature" and "Creature Feature" on WGN in Chicago where my family relocated in 1971.....but nobody ever topped Milton with his downright scary introduction to those classic old monster movies......all of the classic Universal monsters with a very occasional sci-fi flick thrown in. Great memories from long ago and far away!" If you have a memory of watching Milton Budd on Nightmare Theater, email drjitters [at] gmail [dot] com, or sign our guestbook. Craft, Dan. 2000. "Legends of Late Night". In Bloomington Pantagraph. Getout section. Watson, Elena M. 1991. "Television Horror Movie Hosts". McFarland & Company, Inc. NC. see also: E-gor's Chamber of TV Horror Hosts entry on Milton Budd. Jim Knusch's wonderful TV Horror Hosts and Hostesses where you'll find their appearances in magazines featuring a link to the March 29, 1958 TV Guide article 'What a Revoltin' Development'. Cousin Trebor - Way Out - WCIA 1963-1965. Champaign-Urbana. Dr. Terror - Dr. Terror's Tales of Terror - WAND 1973-1976. Decatur.